Richard Strauss and Hugo von Hofmannsthal’s Ariadne auf Naxos was first performed in 1912, in a production directed by Max Reinhardt. 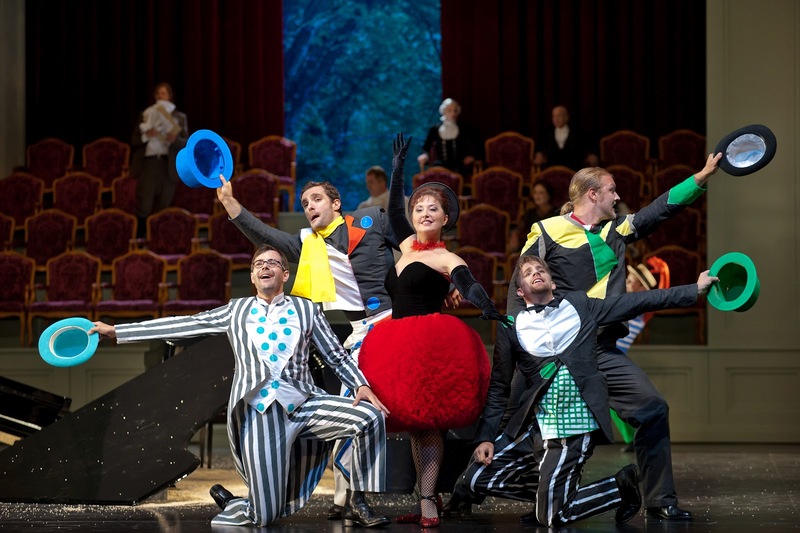 Unlike the version usually seen today, this first Ariadne was a long-winded play-opera-ballet hybrid, incorporating a full production of Molière’s Le bourgeois gentilhomme with dances to incidental music by Strauss followed by the short opera. Less than a decade later these three men would found the Salzburg Festival, so it seems only appropriate that the festival is celebrating the hundredth anniversary of Ariadne. While this convoluted production doesn’t make a good case for the piece, strong performances by Emily Magee and Elena Mosuc in the opera’s main roles and a fantastic deus ex machina by Jonas Kaufmann as Bacchus make it worthwhile. You can read the whole thing here. 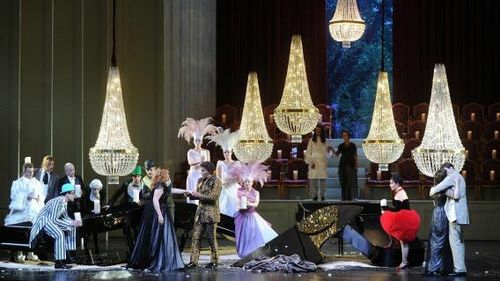 You can also watch this production live on the internet tonight (August 5) at 20:15 Austrian time from Medici. While this production was disappointing in a number of ways I’m still very glad I saw it. 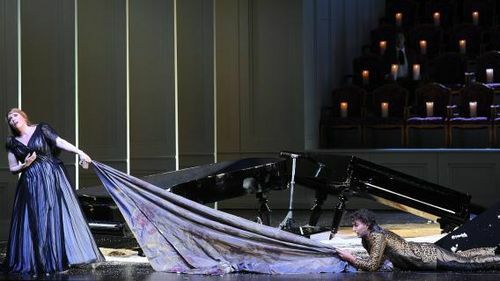 As you’d guess from my blog name I’ve been obsessed with this opera for ages. Some more thoughts and photos below. This was advertised as the 1912 version and in the opera half that is the case (the differences from the standard 1916 version are relatively minor: Zerbinetta’s aria is even more complicated, the commedia characters get some more ensemble material, and Zerbinetta returns to sing more at the end). But the play is radically changed, as I describe in the review. I was disappointed in this first and foremost because Bechtolf is no playwright and the text for the new sections is leaden and directionless, but because it is disingenuous to advertise one thing and then provide something very different. Ariadne is an intellectual, abstract piece, and staging such a work against its grain (as Bechtolf does) requires squarely confronting the aesthetic argument that is already there (as Bechtolf does not). 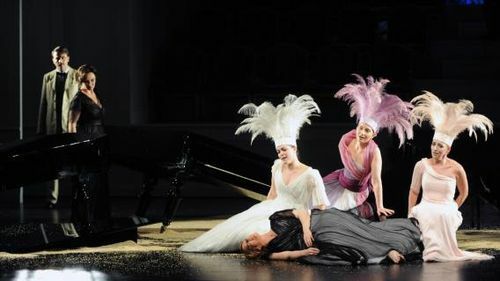 Ariadne is the rare opera that presents a creation myth for itself (Capriccio and Lulu being two others). That myth, that Ariadne and Unfaithful Zerbinetta have been smashed together only by happenstance, is an important factor. 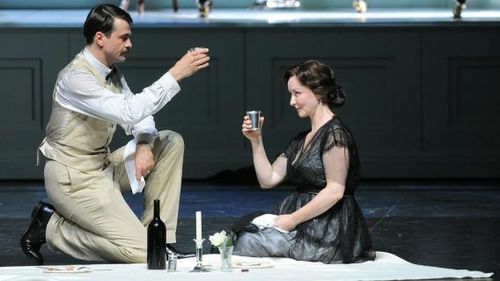 To supersede this myth with another one, that Ariadne is Hofmannsthal’s way of getting under Countess Ottonie’s skirt, creates less a mise-en-abyme than a mise-en-confuse. I thought it might make more sense if Bacchus appeared as a double for Hofmannsthal, but that’s not quite right either, being ungodly. That’s the problem with these historical interpretations: taking something abstract and making it so historically specific runs the risk of reducing and constraining it. The commedia players, given an extended role in this version, seem pointless. The drama of the opera seria Ariadne story is alienated by the interruptions by Zerbinetta as well as M. Jourdain, but the autobiographical angle on Hofmannsthal presents Ariadne as a work of Romantic-style artistic inspiration. The result is tangled. Arguably the actual 1912 Ariadne is also a diffuse work, but I see it operating in the manner of the opéra-ballets of Lully and Molière’s time, presenting a succession of delights loosely tied together. Unfortunately Bechtolf’s version is not so delightful. Finally, about that last scene. As a true Zerbinetta, I must admit I’ve never really understood what happens at the end of Ariadne. I mean, I know what they say happens, but how does one become a god, anyway? Is there a flash of lightning? Staging a metaphysical transformation is difficult; usually it’s park and bark wearing togas. This was, well, I don’t know what it really was, with Bacchus creeping around** and Ariadne running away and the awful shiny leopard (panther? I don’t even know) suit and the chandeliers and the wreckage of the pianos and it is tacky and bizarre in the extreme but then again so is the music and the key word here is “extreme” and it actually seemed kind of electric and convincing in a weird way? That might just because Jonas Kaufmann is awesome in this, though. I’m not sure. Speaking of, I saw Boheme last night and Beczala was ailing and guess who sang Rodolfo from the side of the stage? More on that soon. It was fun. *Herheim is reportedly directing Meistersinger here next year. **Scene will have to be reblocked for any tenor who is not, um, flexible. Thanks for the tantalizing preview. I am getting my popcorn and soda and a comfy chair ready for the webcast this afternoon! Watching this, I agree with much of what you write with such insight. It seemed more confusing than illuminating. Beautifully sung, though. All three principals were astounding. 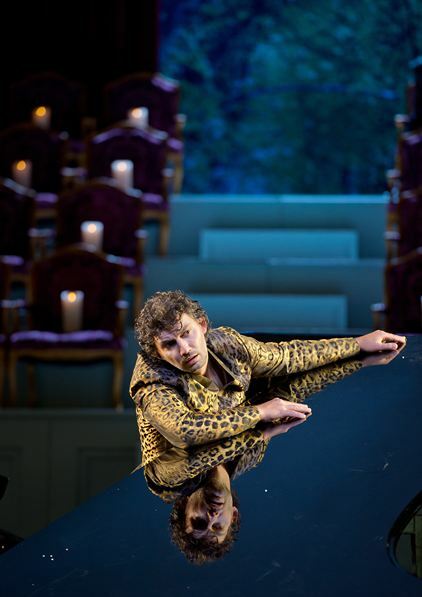 And fyi, Bacchus is often portrayed wearing a leopard skin, so perhaps that explains Jonas's suit. Or not. Watched this on the webcast and have to agree with your comments. All a bit confusing and only rescued by the fantastic singing of the three princpal singers – and by the 'kittenish' antics of JK. I get the leopard/panther suit but not exactly sure why he was curled up on Ariade's lap – but hey, I'm not complaing too much. 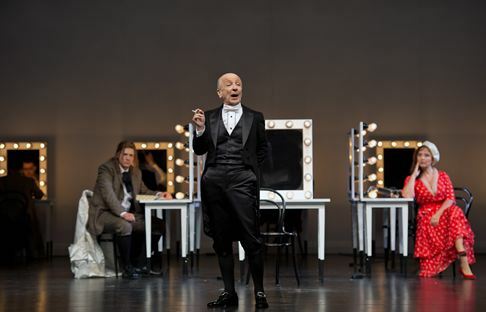 Kaufmann in curlers was also a nice touch. Cats: Yes, but this was a production that otherwise completely ignored myth, so it came across as a non sequiteur. I love Jonas Kaufmann. God knows I do. But he has no business in this repertoire. He is a wonderful talent that, in the Zemsky-Greene tradition, is being pushed into repertoire that is at least one step beyond his true fach. Bachhus is not subtle. Bacchus is a god – an in your face, rattle the rafters god. 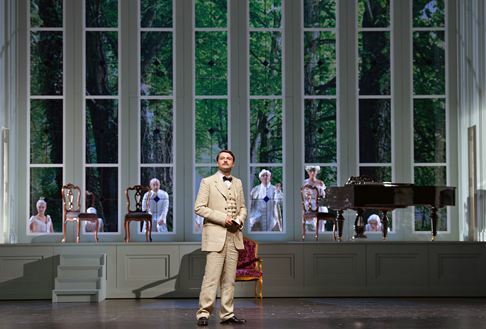 Much like his turn in Wagnerian rep, Kaufmann employs saccharine piano straight tone that has no place – none – in the helden (which he is not) repertoire. 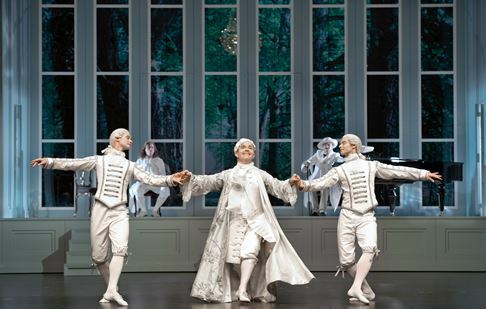 Maybe not a Bacchus for the Met, but he reached the rafters just fine in the Haus für Mozart. For comparison I've also heard Botha sing this in the Theater an der Wien, and that was loud as well. But I didn't think that Kaufmann sounded underpowered here AT ALL.